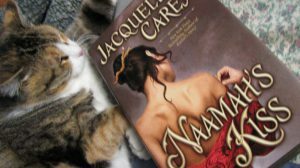 The Terre D’Ange Cycle by Jacqueline Carey(of which Naamah’s Kiss is Book 1 of the third trilogy) is one of my all time favorite series. You don’t have to have read the first two trilogies to enjoy this third one, as it occurs a few generations after the second trilogy. Lynn over at Lynn’s Book Blog is acting as co-pilot for this read along as I deal with medical stuff. Thanks Lynn! Below is the schedule. No problem – I thought the first few chapters got off to a fairly good start – have you started? I will tomorrow. Today I got sucked into a Canadian murder mystery. There was lots of rye whisky, polite cursing, and winter clothing.